What is bacterial speck? Bacterial speck is a common disease of tomato that occurs worldwide wherever tomatoes are grown. The disease can substantially reduce yield when it severely affects leaves early in the growing season. The disease can have an even greater impact on quality (and marketability for commercial tomato producers) when symptoms occur on tomato fruit. What does bacterial speck look like? Leaf symptoms of bacterial speck consist of small black spots (approximately ⅛ to ¼ inch in diameter) that often are more prominent on the undersides of leaves. As the spots age, a yellow halo may develop around the edge. Spots on fruit are very small (almost pinpoint-like) and do not penetrate very deeply into the tissue. The spots can be raised, flat or sunken, and range in color from brown to black. On unripe, green fruits, the spots often have darker green haloes, while on ripe fruits the spots can have subtle, yellow haloes. Leaf symptoms of bacterial speck can be hard to distinguish from other tomato diseases. 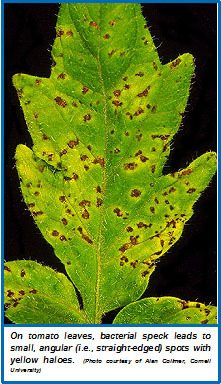 Bacterial spot, (see University of Wisconsin Garden Facts XHT1244, “Bacterial Spot of Tomato”) and tomato spotted wilt (a viral disease) may cause similar leaf symptoms. Laboratory testing may be needed to determine which disease is affecting your tomatoes. Where does bacterial speck come from? Bacterial speck of tomato is caused by the bacterium Pseudomonas syringae pv. tomato. The bacterium is typically brought into a garden on contaminated tomato seeds or transplants, and thrives in cool (63oF to 75oF), wet weather. It can be moved from plant to plant via splashing water (e.g., from rain or overhead watering with a sprinkler) or on hands and gardening tools when working with contaminated, and then healthy plants. The bacterium can overwinter in dead tomato debris or on porous materials such as wooden plant stakes or trellises. How do I save tomatoes with bacterial speck? Once tomatoes are infected, there is no cure. You may be tempted to cut off affected leaves as symptoms develop, but this will likely not do much to minimize or slow disease development, and may actually promote spread of the pathogen. Often the best course of action is to allow the disease to run its course and simply salvage any unblemished fruit as they ripen over the summer. DO NOT eat symptomatic fruit. Although the bacterial speck pathogen is not a human pathogen, the fruit blemishes that it causes can provide entry points for human pathogens that could cause illness. How can I prevent bacterial speck in the future? Start by using high quality, pathogen-free seed or transplants from a reputable seed supplier or garden center. If you have seed that you believe is contaminated with the bacterial speck bacterium and would still like to use it (e.g., it’s a favorite variety with difficult-to-find seed), consider treating the seed in hot water prior to planting to eliminate the pathogen. Treat seed with 122°F water for 25 minutes. To prevent spread of the bacterial speck pathogen from plant to plant in your garden, DO NOT use a sprinkler to water; instead use a soaker or drip hose to water at the bases of plants. Also, only work with tomato plants when they are dry and consider routinely disinfecting garden tools with 10% bleach or (better) 70% alcohol (e.g., rubbing alcohol). Spray disinfectants that contain approximately 70% alcohol can also be used for this purpose. If you have a problem with bacterial speck, remove contaminated tomato debris from your garden at the end of the growing season. This material can be deep buried, burned (where allowed by local ordinance) or hot composted. DO NOT replant tomatoes in the same area the following growing season; instead grow a nonsusceptible vegetable crop. This approach is referred to as non-host crop rotation. For more information on this technique, see University of Wisconsin Garden Facts XHT1210, “Using Crop Rotation in the Home Vegetable Garden”. As a last resort, consider chemical treatments for bacterial speck control. If you decide to go this route, use a product that is labeled for use on tomatoes and that contains copper as the active ingredient. To be most effective, the first treatment must be applied before symptoms have developed. Apply additional treatments every 10 to 14 days as long as cool, moist conditions continue. Keep in mind however, that if used excessively or for prolonged periods, copper may no longer control the disease. Be sure to read and follow all label instructions on the product that you select to make sure you use it in the safest, most effective manner possible. 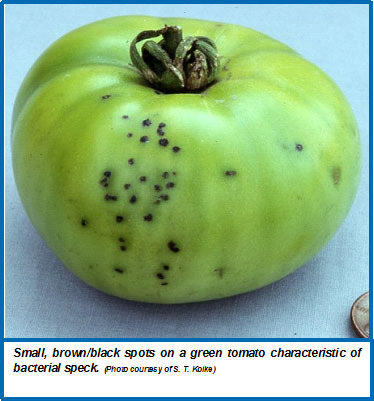 For more information on bacterial speck of tomato: Contact your county Extension agent.